I love this little puppy from Penny Black's Jolly Critters stamp set but since the set was Christmas oriented and the puppy was looking up at a stocking with a present by its feet, I decided to do a little stamp surgery and free him from the holiday ornaments so he could admire a valentine instead. I plan to enter my card in Penny Black Saturday Challenge for February: hearts! Stamp surgery certainly frees up lovely images Tammy! Apologies for not visiting as often as I usually do...Blogger is being a total beast for me. I hope life is being kind to you! 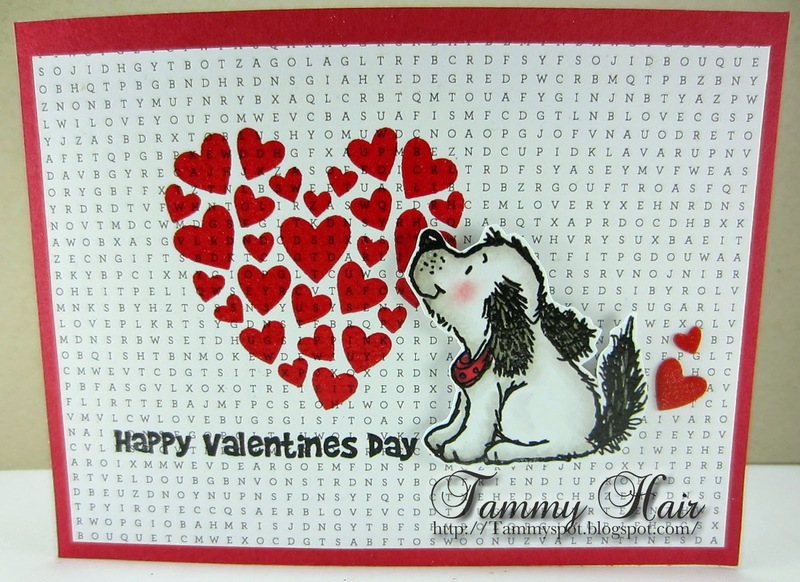 So gorgeous Tammy, I love the cute dog and wonderful heart design. Oh he´s s cute Tammy,fab card!! Fabulous card Tammy and the little puppy is so cute..great stamp surgery and I bet he didn't feel a thing..
How sweet Tammy, love it! Too cute, Tammy! Lovely stamp and card. The stamp surgery went perfect! SOOO cute and love the way he's staring at the heart. Great background paper too. What a little cutie! This is great Tammy. I love when you can get double duty out of an image. I really like the little hearts forming the big heart. You can see through them - what are they cut from? Very intriguing! Totally Adorable Tammy, I love it!!! What a cute idea, Tammy! He looks perfect as a Valentine puppy! Super cute and great way to get more use out of a stamp. I love that adorable puppy!! Your card is very sweet! What could possibly resist puppy love? Sweet, sweet valentine, Tammy! What a darling card! Adorable puppy! SO cute! Fabulous job with altering that image too! Thank you for joining our February Challenge at Penny Black Saturday Challenge! I do hope you will pop over and join us for our March Challenge-Spring Blooms! Oh my...this is just so creative!!! I love the newspaper print background!!! Looks like pup came through the surgery with flying colors!!! I do that alot too!